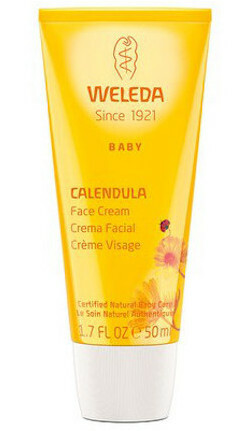 Soothing organic calendula flower extract in this light-weight Calendula Face Cream calms inflammation and provides a protective layer of warmth and comfort. Essential fatty acids from organic sweet almond oil and beeswax are easily absorbed by baby's skin to enhance and maintain its natural moisture. Ingredients: Water (Aqua), Sesamum Indicum (Sesame) Seed Oil, Prunus Amygdalus Dulcis (Sweet Almond) Oil, Alcohol, Glyceryl Stearate SE, Lanolin, Beeswax (Cera Flava), Calendula Officinalis (Calendula) Flower Extract, Xanthan Gum, Fragrance (Parfum), Limonene, Linalool, Geraniol, Citral. Fragrance from natural essential oils.